Is the intent for ease of identification, or to heap on humiliation? That’s the question being asked in Norman, Oklahoma, after Cleveland County sheriff Joe Lester debuted new uniforms for the county jail. Rather than traditional bright orange or traditional white and black stripes, the garish new uniforms look like some kind of New Wave nightmare, with bright pink shirts over top yellow and black striped legs. 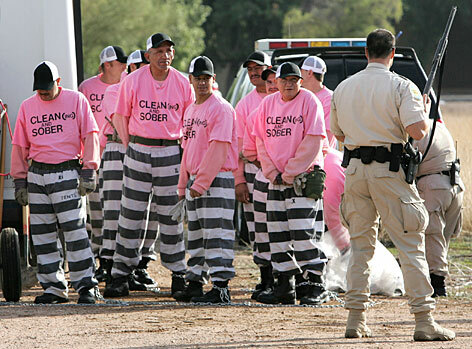 One of controversial sheriff Joe Arpaio’s anti-crime measures was pink prison jumpsuits, in addition to all his other unusual anti-crime policies. I’m no fashion maven, but I know ugly when I hear it, and that’s UGLY. However, the change wasn’t made to be extra ugly; the color change was made because of prison-like fashion trends! “It’s become popular to wear those green or blue medical uniforms, and you can also buy similar orange ones. Particularly, in Norman, orange is a popular color because it’s one of Norman High School’s colors,” said Undersheriff Rhett Burnett, defending the nuclear bumblebee scrubs. Opponents say that the dehumanizing color scheme is simply designed to heap on insult to the greater insult of being arrested. Of course, proponents say that the key to not being embarrassed by garish prison clothes is to not be arrested in the first place.